PUB/SUB (publish/subscribe) is a messaging pattern used to distribute data to arbitrary number of subscribers. In context of ØMQ the focus with PUB/SUB is on scalability, ie. on ability to add more subscribers to the system without overloading it. If there's no subscriber for a particular message in a specific portion of the distribution tree the data should not even traverse associated network segments. Additionally, it would be preferable to pass message through any edge of the graph once only even if there are multiple consumers down that branch of the tree. 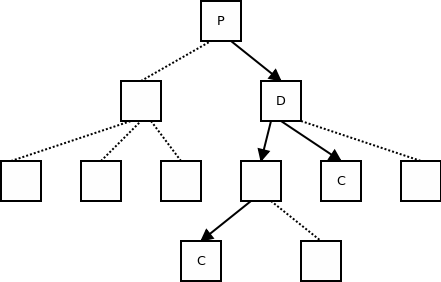 In other words, message duplication should happen as far away down the stream as possible — in this case in the node D rather than in the node P.
To achieve this kind of design subscriptions have to be passed to the upstream nodes so that the upstream nodes can use them to avoud sending messages to the paths where there are no interested subscribers. The property should be transitive, ie. upstream node should forward the subscription to its parent which in turn should pass it to its parent etc. So, when consumer application subscribes to a topic the subscription, in addition to applying locally, hops up the stream until it reaches the ultimate producer(s). The technical difficulty with this model is how to pass the subscription through the intermediate devices. Recall that a device is just a pair of ØMQ sockets connected by user code. Thus, there's no way to implement subscription forwarding in devices without user code taking part in the process. And that's what XPUB/XSUB sockets are for. XPUB is similar to a PUB socket, except that you can receive messages from it. The messages you receive are the subscriptions traveling upstream. XSUB is similar to SUB except that you subscribe by sending a subscription message to it. Subscription messages are composed of a single byte, 0 for unsubscription and 1 for subscription, followed by the subscription itself, ie. the prefix we want to check the messages for. To avoid storing stale subscriptions in individual nodes, disconnection of a peer should result in automatic generation all the relevant unsubscriptions to be passed upstream. For example, if XPUB socket has a single peer who subscribed for topic "A", disconnection of that peer should result in generation of unsubscription "A" that will hop upstream until it reaches terminal producer(s). The other way round, when reconnection happens, XSUB socket should send all its subscriptions to the reconnected peer to reestablish the message flow. Recall that the peer (XPUB) have generated unsubscriptions when disconnection happened. By re-sending the subscriptions the routing tables on the publisher side are renewed and the message distribution continues to work as expected. Let's assume the subscriptions are correctly distributed within the message distibution tree. Let's now have a look at how they should be used by individual nodes to route the messages downstream. The routing in (X)PUB socket is pretty straightforward: If message matches any subscription received from a particular peer, send it to that peer. Care should be taken to send the message once only even if it matches several subscriptions. In case of uni-directional transports such as PGM, the PUB socket does no filtering. Thus, SUB socket gets the whole feed of messages and has to filter out unneeded messages itself. When user unsubscribes from a certain topic, the unsubscription is sent upstream and once it reaches the terminal producer, the producer won't sent any corresponding messages downstream. However, this operation takes time. In the meanwhile messages that match the no longer existent subscription keep flowing downstream. Device reads messages from XSUB socket and passes them to XPUB socket. Thus, the filtering would be done twice in a row is filtering is implemented in both XPUB and XSUB socket. To address these problems, ØMQ filters messages in SUB socket, but not in XSUB socket. One specific problem with the above model is that it requires bi-directional communication: data are passed one way, subscriptions are passed the other way. Thus, we have to reconcile this model with uni-directional transports such as PGM (reliable multicast). The solution at the moment is not to forward subscriptions upstream from PGM consumer socket to the PGM publisher. Additionally XPUB socket would send a "subscribe to all" subscriptions upstream once it is bound to PGM transport. That way every message from upstream is multi-casted and filtering happens in the XSUB socket. Using IGMP as a way to pass subscriptions upstream via PGM. This would of course limit the filtering capabilities to "subscribe to this multicast group" instead of "subscribe to all messages starting with this prefix". It should also be noted that IGMP passes subscriptions only from consumer to the network switch/router. They aren't passed any further (from the switch to the publisher). Creating an additional data flow from PGM subscriber to PGM publisher (via TCP, UDP or whatever) thus basically turning uni-directional transport into a bi-directional one. There's is one additional scalability bottleneck with the above model. Imagine the case of global TV broadcast over ØMQ. All the viewers are subscribing to different channels, some of them are changing channels in pretty high rate etc. If all the subscriptions were forwarded all the way up to the ultimate broadcasting server, the server would spend all its time processing subscriptions with no time remaining to broadcast the content itself. Or, more likely, it would collapse under the weight of all the (un)subscriptions coming in. To make the PUB/SUB model really scalable we have to aggregate the subscriptions in such a way that subscription traffic at each lattice of the distribution tree is roughly the same. To achieve that we can send just the diffs rather than passing each individual subscription. That way we can ensure that the subscription traffic at publisher won't grow exponentially with depth of the tree. The current implementation does so by eliminating duplicate (un)subscriptions. Imagine an XPUB socket. Consumer connects and subscribes for messages starting with "A". XPUB socket forwards the subscription upstream. Then another consumer connects and subscribes for "A". This time, XPUB socket increases the reference count on it's internal represenation of the subscription, but doesn't send the subscription upstream — it's already there so why bother? The other way round, when the first consumer unsubscribes or disconnects, XPUB socket decrements the reference count on the topic, but doesn't forward anything upstream. There's still the second consumer that needs the "A" messages anyway. Only when the second consumer disconnects as well, the unsubscription is sent upstream. The algorithm above is clearly not optimal and can be improved in the future. If there an "A" subscription, "AB" subscription is still passed upstream even though it is subsumed by "A". We could simply drop the "AB" subscription and everything would work as expected. We would have to compensate for the optimisation during unsubscription from "A" though. Instead of sending unsubscribe(A) up the stream we would have to send sequence of subscribe(AB) and unsubscribe(A). You can imagine different optimisations to the aggregation algorithm. However, the crucial point is that the PUB/SUB protocol is designed in such a way that the actual aggregation algorithm doesn't matter. Every node in the distribution tree can use its own aggregation algorithm and the whole distribution tree would still work as expected. Hopefully, different implementations of scalability protocol can take advantage of the fact and differentiate on the basis of more or less efficient subscription aggregation algorithms. Imagine the case where producing a message is a CPU-intensive task. Producer would like to eliminate the work in case there's nobody interested in the message. To do that it has to be aware of the subscriptions issued by the downstream nodes. Luckily, this is exactly what XPUB socket allows it to do. It can open an XPUB socket and start listening for the subscriptions. If a message is about to be generated, the producer will check its list of subscriptions and proceed only if there's an appropriate subscription present. Another scenario for plugging into subscription mechanism is creating bridges to other messaging implementations, both generic and ad hoc in-house systems. The same way, bridges can be built to interface with other messaging systems: JMS, STOMP, PubSubHubbub, Redis etc. This article proposes a PUB/SUB system with minimal bandwidth requirements as it is currently implemented in ØMQ/3.0. The long-term goal is to reconcile this system with systems used by different messaging implementations and standardise it as an SP protocol.